The FUSION CELL concept and intent: 1. 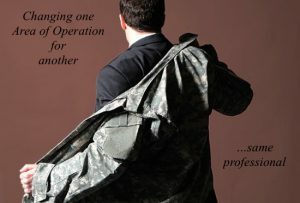 Assist talented military folks in finding companies and/or employment worthy of their talent and leadership prowess. 2. Assist SELECT companies and/or employers in connecting with these highly talented folks. Everyday, extremely talented military personnel separate from the armed forces after having served this great nation. Many of them, having reached the highest levels of responsibility, classifications, education, and respect may find themselves pondering the next step post military service. The DoD has spent a considerable amount of money providing these folk with top-notch training, skills, vocations, education, and tremendous leadership opportunities/ability…more ofter than not born in war. Many of these elite candidates have a Bachelor/Masters degree and are motivated to work for a company that has purpose and a good mission. The FUSION CELL team is charged with helping and representing these elite members (Special Opera tions Force (SOF)) in finding their next position, companies looking for senior level leaders (key positions) as they transition into the civilian market. We know one incredible leader can mean huge upside to a company in terms of leadership, morale and increased efficiency and revenue. Quoting the All Blacks rugby team- “Successful leaders have high internal benchmarks. Bottom Line: Getting the right people on the TEAM, in the room, and with the authorities to execute! The elite military veteran has a STRONG ethical code consisting of three fundamental and enduring values of integrity, service, and excellence. The unique and dangerous nature of DoD activities demands these core values as well as relies on two “Core Enablers;” intimacy and accountability. These characteristics of elite teams/members are an inherent part of a warrior ethos in all situations, both in and out of uniform. The leader (mil.) is responsible for setting a team culture that will succeed on any tasked endeavor, humanitarian or combat, in the United States or on foreign soil. The responsibility of war bears great responsibility, and the team culture is pivotal in laying a foundation of ethical and honorable decision making. The Leader is responsible for establishing a healthy and honorable team culture. It begins with the Leader’s intimate relationship with his key personnel and extends to all others thereafter. To earn a culture of respect and dignity, the Leader demonstrate these traits at all times, to superior and junior and their families. Hold himself and his team accountable to these expectations. Create a team free of discrimination or harassment. Seek critical feedback on his actions; provide critical feedback to his people, usually in private. Know his people and their families, care for them deeply, seek intimacy. In order to insure the highest probability of successfully completing elite training pipelines, program, and eventual positioning, candidates are screened thoroughly. This process identifies candidates that possess critical individual characteristics required to provide leadership during combat rescue operations across a diverse spectrum of insertion / extraction capabilities as well as enemy, environmental and geographic threat considerations. Candidates must be able to assess situations quickly, develop and implement decisions under the stressors imposed by high levels of personal discomfort and responsibility associated with Personnel Recovery and recovery operation mission profiles. Because of what we do, our standards must be higher than those of society at large. The American public expects it of us and properly so. In the end, we earn the respect and trust of the American people because of the core values we demonstrate in and out of combat. Many of these overachievers seek their next challenge, home, and/or cause worthy of the excellence they have grown to expect. Organization already living a similar culture (or those longing for) may be a great fit for SOF-minded personnel. Through S.E.I. and our network, we have direct access to many top-level recruits from the SOF world here and nationally. You are welcome to forward a resume.